Children of all ages love the magic of Truffles the Magician! Truffles' award winning fun-packed entertainment will help make your child's party truly out-of-this world. 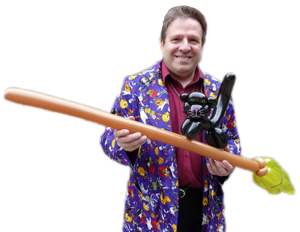 Voted one of the UK's top six childrens entertainers, Truffles' professionalism and experience will make sure your party goes off with a bang! Whatever the size of venue, from the smallest living room to the largest hall, Truffles will make your party come to life. Truffles can entertain any number of kids; no party is too big or too small. Truffles is a Leeds childrens entertainer and specialises in birthday parties, teddy bears’ picnics, Easter shows, Christmas festive fun, tricks and treats for Halloween and other seasonal specialities. To make the party even more special, straight from the land of make believe, why not invite our three life-size teddy bears. All this adds up to a fantastic time for children of all ages and a stress-free time for adults. Truffles holds an up to date Police (CRB) check, is a member of Equity, and has full public liability insurance. 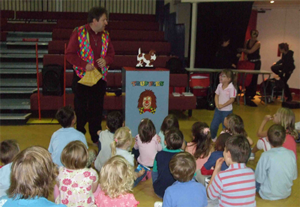 Truffles is one of the most popular childrens entertainers in Leeds, so book early to avoid disappointment. Truffles performs at children's parties in Leeds, Bradford, Wakefield, Harrogate, Halifax, Huddersfield and the surrounding area.